Discussion in 'South American Tank Mates' started by flori, Apr 8, 2019. Hi, I've added 12 Paracheirodon simulans to my blackwater tank about 3 weeks ago. I considered them 'dither fish' for a pair of Apistogramma borelli that have yet to move in. The P. simulans though are extremely shy. 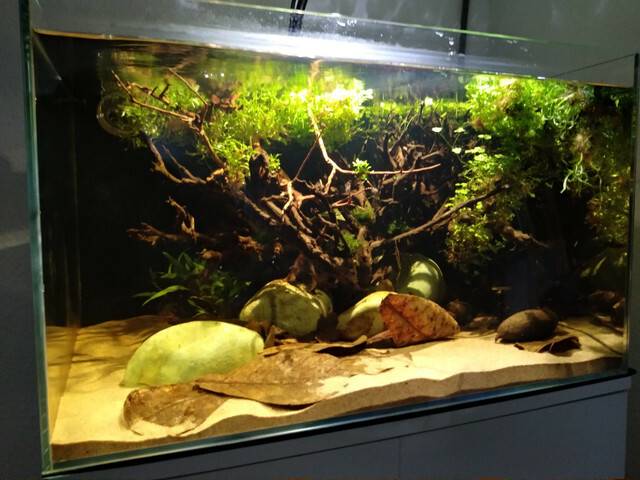 When I'm in the room or get near the tank, they won't show at all but rather hide behind / underneath wood and stones. I was gone on holidays for a couple of days and set up a webcam to see if everything's okay with my tanks, and they were merrily swimming all around the tank. Since I've returned, I haven't seen them at all! I can't even feed them properly, I just put in food where I think they're hiding, then leave the room, hoping they'll fetch it when I'm gone. I know these fish are caught in the wild and have an arduous trip behind them, do they just need more time? Do you guys have any experience or idea how I could make them feel more secure? If I add Apistos at this point, will the P. simulans' shyness 'rub off' on them, and make them just as skittish? I'd give them more time - and stay around the tank as much as possible. BTW you do know that this species is a fry predator don't you? I was under the impression that pretty much every species is a fry pedator to some extent; and the P. simulans kept coming up when searching for tank mates for Apistogramma borelli - would you advise against keeping them together with A. borelli? I would have gone for pencil fish instead of the P. simulans but read they like to jump a lot and I want to keep the tank open. If you want to raise only a few borellii, then it's worth a try. Still, 12 hungry tetras against 1 mom ... . BTW I keep Dwarf Pencilfish in an open-top tank without any problems. Of course the surface is covered by Salvinia. I wouldn't do this with my One-line Pencilfish (N. unifasciatus). I'll see how it works out, if it doesn't I have another tank for the P. simulans to put into. Meanwhile, I solved the mystery of their shyness: obviously, the tank was too dark (it was quite a bit darker than in the picture).